Category Archives for "Simple Pedometers"
It’s simple and effective that’s why we chose the Realalt 3D Trisport as our Best Clip on Pedometer. The 3D TriSport Walking by Realalt is one of the bestsellers among the simple pedometers. It can be worn around the neck, attached to the waistband with a clip or simply tucked into the pocket thanks to 3D TriAxis sensor technology. The device stores the data up to 30 days, so you can track your own progress and fitness goals. Setting up the device is very simple. First, enter the date and time and decide whether to use the 12- or 24-hour system as well as km or miles. The 3D TriSport works completely autonomously. It does not need to be connected to a smartphone via Bluetooth. The data remains only on the device and will not be transmitted to the internet. Therefore, it is also suitable especially for seniors and children. The device is not completely intuitive. We first had to study the manual to complete the setup. On the back there is a foil in the battery compartment, so that the supplied CR2032 battery does not discharge. For this purpose, a small screwdriver is included, with which the compartment can be opened and closed again. The stride length must be entered manually. In many other fitness trackers, this is automatically determined by the body size. This is best done by taking 10 steps, measuring the distance and dividing it by 10. The measurement of the steps is very accurate. However, even this pedometer can not always know exactly whether it is a real step or some other movements. When driving over cobblestones or riding a bike over a bumpy road, a few steps are added. This is normal and distorts the daily target only slightly. Realalt supplies a sturdy clip and a Neck Lanyard with the pedometer. Above all, the clip is very helpful and allows a safe attachment to the belt or waistband without being noticed during the day. The large, clear and easy-to-read display shows the time and number of steps clearly legible. However, the display is not illuminated at dark. You might be confused at the beginning. The total number of steps are not reset to 0 automatically at midnight, as with many other pedometer meters. The total number of steps under the menu item “Total Step” keeps counting until you reset it manually. However, the steps walked during a day are found under the menu item “steps” and resets automatically. 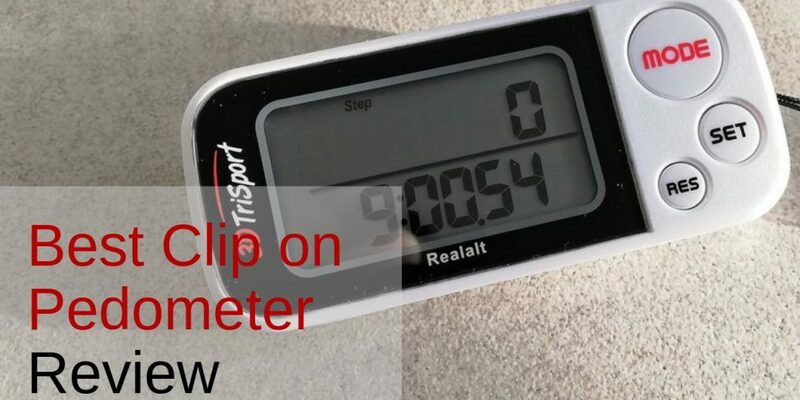 This clip pedometer does what it is supposed to do for a very reasonable price. It is a very robust and accurately counting clip on pedometer. Recommended for those who do not want to wear an activity tracker on their wrist. Fitness is essential for Seniors. Seniors should develop a routine to walk a certain number of steps every day. Regular exercise helps people to slow down the aging process and prevents the development of diseases, especially the positive effects of regular walking on blood pressure has been proven. 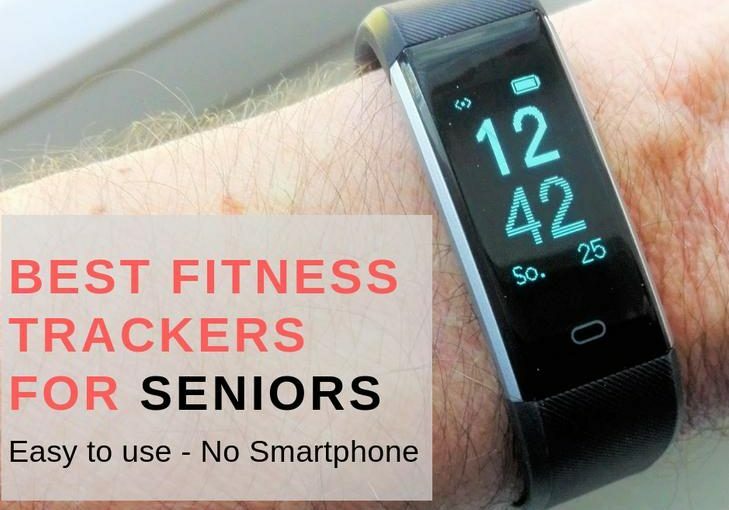 In this article we have compiled a few Fitness Trackers that are suitable for elderly people, taking the specific needs of this consumer group into account. We have put together good fitness trackers for seniors that are easy to use, easy to read and, of course, measure accurately. Why do seniors need a Fitness Tracker? An electronic tracker can be a valuable tool to gain more control over the individual daily activities. A Fitness Tracker or Fitness Bracelet helps to build a routine of walking a constant number of steps each and every day. Walk 10,000 steps per day! But anyone who has actually walked 10,000 steps a few days in a row knows that this goal is not necessarily suitable for all older people. It can be quite exhausting. Actually, it doesn’t really matter if it’s 7,000, 5,000 or just 3,000 steps a day. It is important that you regularly walk an even number of steps. Define your own goal! A goal that can be achieved permanently! On the one hand, the goal should be challenging, but on the other hand you should still feel comfortable and not exhausted. What characteristics should a fitness tracker for grandma and grandpa have? One of the most important features for seniors is ease of use. If you only want to measure the number of steps you take during a day, you will not need a device that measures your heart rate, sleeping patterns, or minutes in motion. Often it is sufficient to simply display your data on a display on the gadget itself. A cheap, simple and accurate electronic tracker can do the job very well. Ideally, you do not need Bluetooth, a Smartphone App or a Computer to set the tracker up. What is the point of measuring all this data when the data is presented on a small screen that is hard to read for the elderly? Seniors with failing eyesight need to read the numbers easily and without strain. A tracker needs to have large and readable information. Most fitness tracker wristbands only work via a Bluetooth connection with a smartphone. The devices capture much more than just the steps and then present the data on a dashboard on your smartphone. The data is not necessarily stored only locally on your mobile, it can be uploaded over the internet connection of your Smartphone even to a server abroad. If you are not used to technology, choose something simple, something without bluetooth, where you first need to find out how to connect the device to your smartphone before you can even use it. The Sleep tracking feature available on many trackers allows users to track how long they sleep and the quality of their sleep, which can be helpful for seniors with insomnia. In this case you need a fitness bracelet and the according app on your smartphone, except the Willful Band that offers sleep tracking without the hassle of connecting the tracker to a phone. For most of the other products, the data is transferred via bluetooth to the corresponding Smartphone app for analysis and display of the data. Water and sweat resistant bands are important for seniors, as this keeps seniors from having to take their device on and off for showers. It also prevents the tracker from getting damaged if they get caught in the rain or have an accidental spill of a drink. This is one of the only Fitness Tracker Bracelets that doesn’t need a computer or a Smartphone. It is easily navigable with one touch button. It shows the time and tracks the steps taken accurately during the day and also calculates distance traveled and calories burned. When you use the tracker for the first time, you just need to enter your age, height, weight, gender as well as the time and date. That’s it. With a simple touch on the button you can change the various function displays: Time, Date, Steps, Calories, Distance, Duration of activity and Sleep Monitor. The Sleep Mode tracks your sleep quality anytime. However, you need to set the sleep mode manually. All the data can be checked on the bracelet, which is very suitable for older people who don’t want to use it with a smartphone or who don’t have a smartphone. It has an integrated battery that can be charged via a USB Port. Willful Tracker automatically resets the number of steps to 0 at midnight. You can also check out our detailed Review of the Willful Non-Bluetooth Pedometer. The Letscom Fitness Tracker has some more advanced features than the Willful. It includes a watch, a step counter, a Heart Rate Monitor and Calorie Counter. I (in my Mid 50ies) have been using this product for over a year now. The battery life is really good and the step counter is very accurate… and it looks really cool on my wrist, not bad for a fitness bracelet for under 30 USD. However, if you set it up for the first time. You need to configure the settings via a Smartphone App. You need to install VeryFitPro App on your Smartphone which is available for iOs and Android. With that you have the ability to synchronize your performance data daily with your Smartphone, so it is not lost. I actually never do this, I just look at the daily steps at night. The tracker then resets the number of steps to 0 at midnight. Another cool feature of this tracker is the work out mode that you can use for special events. For instance you go on a hike and just want to know distance, calories burned and number of steps for that particular exercise. You just press the screen in the “Walk” section when you start and when you return and the device calculates the data for you. The steps are counted very accurately. The tracker will start counting after only 35 steps to avoid jerky hand movements or shaking while driving. Also cycling over cobblestones does not add any steps. The modern 3-D sensor technology is very accurate. Once you reach your daily goal, the Fitness Tracker vibrates on your wrist! Done for the day! The display is very easy to read even in sunlight. The Letscom fitness wristband is additionally equipped with a heart rate monitor. It is not 100% accurate but good to go if you just need to monitor your workout performance. In the Event Mode it has Walk, Run, Bike per default. Other sports such as soccer, running, cycling, hiking, mountaineering, badminton, fitness, dynam. Biking, treadmill, yoga, basketball, tennis, dancing can be added via the App. The sleeping behavior is also monitored and displayed over time. I did not test that, because at night all electronics are turned off and banished from my bedroom. 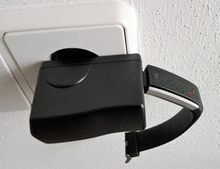 The Letscom Fitness Bracelet can be charged at any USB port. You can plug it to charge into an USB port of your laptop or use any mobile phone charger (Android). For this, only the bracelet is removed at the end with the “0”. If you choose to use the App, the synchronization is automatic. As soon as you have activated Bluetooth on your smartphone, the tracker is recognized and the data is synchronized. It is important to first activate Bluetooth on the smartphone and then open the app. Then it works automatically. Another useful feature is the remote activation of the smartphone camera. For selfies you can activate the feature in the app. Pressing the touch screen will trigger the camera. Problem: The photos do not appear in the normal picture gallery but in the folder vifit2.2/DCIM/VeryfitPhoto in the file manager of your phone. The GPS pioneer Garmin entered the market of fitness bracelets with the Vivofit Activity Tracker series. The entry-level model from Garmin is the Vivofit. If you think of Garmin you think of GPS. But the Vivofit does not support GPS. The intelligent fitness bracelet follows the daily activities and motivates to more exercise. It records the daily pace, distance, calories, and heart rate when a chest strap is worn, and stores that data for over a month on the device. For most other activity trackers, you have to enter your goals yourself. The Vivofit is intelligent and can set the goals automatically based on the individual movement profile. It also facilitates the gradual achievement of goals by automatically setting smaller achievable goals. Whether you are an experienced older athlete or a beginner at old age; the Vivofit adapts. Another useful feature is the inactivity notification feature. Like many other intelligent activity trackers, it warns you if you stay too long without movement. But unlike the competition, which is usually only humming, the Vivofit shows a red bar, which grows slowly, as long as you only sit around. To get rid of the beam, you just have to get up and move until it disappears. The activity tracker from Garmin also includes a sleep monitoring feature. It is not as sophisticated as some of the other Fitness bracelets, but it provides a solid record of the duration of sleep and can clearly distinguish between sleep and waking phases. In addition, the Vivofit offers the ability to measure the pulse, in combination with a compatible chest strap. The actual device is in a robust rubber band and is waterproof. The bracelets are available in different colors and can be reordered if required. Very impressive is the life of the battery. Due to the energy-saving e-ink display, which dispenses with a backlight and the absence of constant synchronization of the Vivofit comes for a year according to the manufacturer with a CR1632 button cell battery. Many comparable activity trackers with battery need to be recharged regularly. Sync with Garmin Connect at the touch of a button. 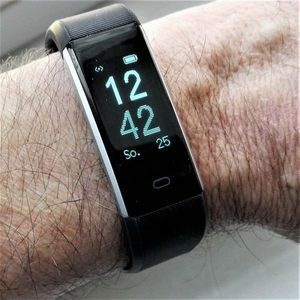 Like with the higher-priced versions like the Vivofit 2, the Vivosmart or even the Vivoactive with GPS the synchronization takes place automatically. Garmin Connect is Garmin’s online fitness community. There, the data can be evaluated and displayed graphically. Garmin Connect can be accessed through the browser or via iOS and Android apps. This platform also allows data to be linked to other Garmin devices. However, you need a smartphone of the newer generation with Bluetooth LTE. Garmin Vivofit is not compatible with older Android devices or older iPhones (iPhone 4S or earlier). However, it can be connected via a USB stick with the PC or Mac and the data can then be evaluated via the web interface. Walking is good for your entire body and can help you gather your thoughts, manage your stress and clear your mind. From top to bottom, this basic exercise, which most of us learned long ago, is one of the healthiest activities we can participate in! Walking poles for seniors can take a bit of getting used to; if your doctor has prescribed a walking routine to increase your overall health, consider meeting with a trainer or physical therapist to make sure your find poles that are the correct length. The rhythm is easy to learn, but you won't get the full benefit with ill-fitting poles. These lightweight poles offer a variety of grips and can be extended to the correct height for your needs. If arthritis in your hands is a concern, be aware that you can purchase extremely light poles; for those trying to build up their upper body or planning mountain hikes, heavier poles are available. Depending on where you walk, purchasing poles that be completely collapsed for easy transport is critical. Work with a professional to make sure that you can easily set the proper length of your poles quickly; they won't do you any good if they're not easy to use! The Montem poles are made mostly of aluminum and have carbide tips for durability. They are easy to grip, no matter how much you sweat, thanks to the EVA foam and cork handles. These FitLife poles also have easy grip handles and wrist straps, but are locked down with a twist. However, if twisting isn't a problem, these poles are a bit easier on your budget than the Montem. They're also available in bright shades of blue, red and purple! Your High Trek Trekking Poles offer users of all fitness levels a great tool for getting out into the fresh air. These poles offer soft grip handles and flip lever adjustments, ideal for height changes while wearing gloves or if your dexterity is limited. You'll get a variety of tips so you can customize the pole to the terrain! For the price, these poles make it easy to get out and about. They're also available in a variety of bright colors. Your walking poles for seniors will get you out and moving! Invest in a fun pair of telescoping poles, work with a pro to get them set at exactly the dimensions you need, and get outside to move your body through space. You will enjoy the lift that walking with these poles provide! Accurate pedometers and stylish Fitness Tracker watches are not expensive anymore. You do not actually need a Fitbit or a Garmin for more than 100 USD if you just want to monitor your daily steps. We have put together the top rated pedometers and Fitness bracelets from Amazon which all cost less than 25 USD. They all use accurate 3-D Sensor technology. That means you can just put them in your pocket, place them in your bag or even wear them around your neck. Regardless of their position, they count the steps accurately. You will be amazed for how little money you can monitor your daily performance and become fitter. Small adn easy to wear in a pocket or purse or clip on your waist, belt, ankle, shoe or bra. But even fitness bracelets with a watch are available for under 25 USD. The Willful Bracelet and the iGank T5 don’t even need a Smartphone to be operated. The Y3G actually needs a Smartphone App in order to set it up initially, but from there on you can use it autonomously. The app for the YG3 lets you see your performance over time, whereas the others reset to 0 steps at midnight. Thanks to the drop in prices for modern motion sensors simple pedometers and easy to use fitness bracelets are now available for way under 25 USD. If you just need the basic operations you don’t need to spend 100 bucks or more for fancy but complicated Smart bracelets or Watches. Unlike other electronic devices most pedometers don’t tend to be already obsolete just 6 months after their market introduction. One of the classics in the simple pedometer market is the Omron Alvita series which was originally introduced in 2012. It comes in different versions. We focus on the HJ-321 which also measures calorie consumption and switches automatically to aerobic mode and the HJ-320 which is a more basic pedometer that only counts the steps and calculates the distance. However, there is hardly any difference in price, just about 2 Dollars. Today, many kids spend most of their free time watching TV, playing video games or on their smartphones. Sports and outdoors activities are becoming increasingly rare. Children, however, like competition. That’s why they get so obsessed with video games. They just can’t stop until they reach the next level. You can use that inner drive of your kids wisely to get them motivated and playfully raise the level of physical activity. Pedometers have found their way into everyday life. They are used to measure our daily activity and encourage us to move more. Experts recommend that you walk or run 10,000 steps per day. But how does a pedometer actually measure that? How does a pedometer measure the steps? How does a pedometer app work in a smartphone? What are the most popular pedometer brands? How much a pedometer costs and where to buy it.